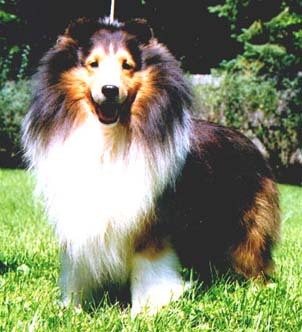 Ch Barwoods Entrepeneur ROM: Sable and white dog, bred by Barbara Thompson and whelped May 13, 1992. Sire: Ch Macdega Glenhart Grand Prix ROM; dam: Ch Barwooods Escapade. As of the end of the July 1998 Gazette, sire of 13 Champions. He is Line CHE Part IId and Family 6. Information current through August 1999 Gazette, courtesy of Bob Miller.